Manchester was late to the yoga party. It’s had a number of classes for many years, but in the last two years, the scene has literally exploded with studios on industrial estates, in deserted buildings, and purpose built studios and gyms. In this short guide, we’ve tried to cover some of best studios in the suburbs– and to make a note of which classes are suitable for beginners. As times of classes often change, we’ve not included actual times. For more information, click on the links which should take you to the studio timetables. Reasons to head out of the city for a stretch are many: more light, more classes and, perhaps most importantly, the sense of head space that comes from physically leaving the metropolis in exchange for the leafy suburbs are just a few good ones. Chorlton is one of Manchester’s most charming areas, characterised by ethical food stores and lots of BBC employees, as well as is some of the city’s finest yoga classes. The Yoga Rooms is one of the best established studios. A spacious, warm, first floor space feels calming and zen. Candles might flicker around the sides of the room, while only the best equipment stands, in perfect condition, along the back wall. The kind of classes on offer here include restorative yoga for those with chronic fatigue, mum and baby yoga, ashtanga and many more. There’s a focus on gentle, kind practice; it’s a place to good to yourself after a long day or week. For fitness queens, One Yoga is the ultimate destination in Chorlton. Run by yogi extraordinaire, Andrea Everingham, this huge, warehouse-like space on an industrial estate is one of the few Manchester outlets to offer intense Jivamukti yoga. A relatively recent Mancunian import from New York, Jivamukti is one of the most dazzling and physical of yoga practices, with students left sweating and, often, in a bit of a daze. Classes typically include instruction, listening, music and chanting as well as serious physical work. The focus is on actively building muscle, rather than more passive yoga styles, which let gravity and poses do some of the ‘work;’ for you body. One Yoga welcomes new students, nevertheless, and with classes almost every night at 6.15pm and 7.30pm, there’s something for everyone. The studio also offers mediation, ashtanga, mum and baby yoga and hatha yoga classes. Heading further out of town, towards Didsbury, Yoga Tara serves up a range of classes that include beginners yoga, pilates, mum and baby yoga and Jivamukti served up in a picturesque school hall. Arriving early is recommend as Tara has a loyal following in the local community and beyond. Her style is gentler and perhaps more open to absolute beginners than Jivamukti at One Yoga. The space is a particularly light and airy, and classes are well timed to ensure that you have plenty of warm up and cool down time. Explore the different class styles on offer to find one that best suits your needs. Yoga Manchester is a collective offering a number of classes around the suburbs of South Manchester including Heaton Moor, Altrincham, Didsbury, Cheadle Moor, Sale and Fallowfield. Almost all classes are drop in, very reasonably priced, and over half are suitable for beginners. Spaces include school halls and church halls; they’re a great place to meet new friends. Heading north, Prestwich has its own Hatha yoga classes at the Inner Light Wellbeing Centre. These classes focus on precision and alignment for core stability and posture, rather than the more dynamic Ashtanga and Jivamukti styles. 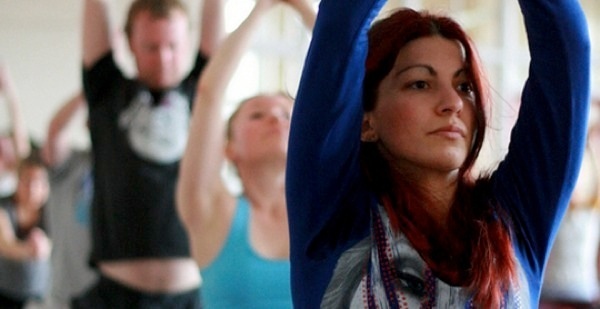 Browse our deals for yoga in Manchester.